KASHIDUN - Movement: japanese Quartz Original Movement, precise quartz movement for accurate time keeping. Durable and lightweight stainless steel case and black metal band with buckle closure; Chronograph functions and date windowan easy to operate date window is located at 3 o'clock. Sleek, valued, mature, exquisite and sporty watch for men. Chronograph function, black crocodile grain leather strap with buckle closure, date calendar with the quick date function, water resistant to 30 meters, you can set the date on the watch with turning the crown for every 24-hour period. This classic quartz watch scratch-resistant sapphire crystal lens, stainless steel case. KASHIDUN Men's Watches Luxury Sports Casual Quartz Wristwatches Waterproof Chronograph Calendar Date Stainless Steel Band Black Color B-Silver Black - Main features:brand: kashidun watches categories: male table watch style:Casual, Sporty, Classic Movement type: Quartz watch Shape of the dial: Round Display type: Analog Hour formats: 24 Hour Special features:Imported Japan quartz movement. Protective sapphire crystal protects the watch from scratches, minutes, Three sub-dials track hours, 60 Seconds, Day and Night Particularly Independent Dial of 1/10 Second, seconds, 60 Minutes with stainless steel case and sapphire dial window. Gifts: the watch is suitable for every occasion outdoor, business, also a great gift for family and friends; Luxury simple design watch, party, perfect gift with cleaning cloth for men. Waterproof: water resistant to 30 meters99 feet, withstands splashes or brief immersion in water, but not suitable for swimming or bathing; If you have any questions, in general, Please feel free to contact KASHIDUN After-sale Service Email: kashidun. KASHIDUN - Package including: 1x men watch; 1x original watch box; 1x english instruction Manual; 1x Band Adjustment Toolpin; 1x Cleaning Cloth; Customer Note: The color may be a little different due to the effect of light and moniter setting. Material★ japanese quartz movement, provide precise and accurate time keeping. Please do not press any buttons in the water or wear this watch for longtime underwater activities. Feature★ chronograph second, Chronograph minute, 24-hour, date and cutout hands with luminous tips. Function★ all sub-dials and buttons are functional, Full Functional Chronograph, 30M waterproof and Date Display. Men's Watches Luxury Sports Fashion Casual Chronograph Waterproof Quartz Wristwatch Stainless Steel Women Watches - Design★ analog dress watch casual design, Stainless Steel / Leather band, bring you back to the classic. Also make it a great gift for family or friends. Customer service★ please do not worry any quality problem, all watch in our store will enjoy 24 Months warranty and 30 Days money back guarantee for any reason.
. All of three sub-dials are good working, All of product directly from watch factory, We accept drop-shipping service and OEM. Material&type: ●dial window material type: sapphire lens ●band type: stainless steel ●gender: male;man;boy;Unisex;Masculino ●Watch Style: Dress;Business;Casual;Sports ●Watch Audience: Freelancer;Businessman;Students;Worker;Artist ●Clasp Type: Push-button-clasp Watch Information: ★Dial Case Diameter: 1. KASHIDUN TL839-JinZhen(H.G) - Material★ japanese quartz movement, provide precise and accurate time keeping. It uses less battery power than most other watch illumination systems, enabling your watch battery to last longer. Sleek, mature, valued, exquisite and sporty watch for men. Chronograph function, date calendar with the quick date function, Black crocodile grain leather strap with buckle closure, water resistant to 30 meters, you can set the date on the watch with turning the crown for every 24-hour period. Kashidun is always with a spirit of the craftsman and moving time forward. Guarantees precise and punctual timingSafety buckle closure, easy to wear and not easy to fall off. Package contents:1 x kashidun quartz men watch, with the first watch made in previous time, 1 x kashidun Elegant Watch Box, 1 x Instructions, design, 1 x Kashidun Random Gift, Brand Description:The History of Kashidun, Kashidun entered the Hongkong watch market in 1982 when the watch industry discovered huge potential about our brand's technology, and value. KASHIDUN Men's Watches Luxury Sports Casual Quartz Wristwatches Waterproof Chronograph Calendar Date Stainless Steel Band Black Color A-Black Rose - At 2008, kashidun entered chinese online watch field confident that it could develop timepieces that would lead the market and we did it as the top three. After that, korea, singapore, Thailand, We explored the Asian watches market Japan, and Taiwan, etc. In 2014. Now, kashidun is not only focusing its efforts on the Asian-Pacific region market but also will exploit the oversea market. However, the most important are our products which are Kashidun Watch. KASHIDUN - Protective sapphire crystal protects the watch from scratches, minutes, seconds, Day and Night Particularly Independent Dial of 1/10 Second, 60 Seconds, Three sub-dials track hours, 60 Minutes with stainless steel case and sapphire dial window. Gifts: the watch is suitable for every occasion outdoor, party, also a great gift for family and friends; Luxury simple design watch, business, perfect gift with cleaning cloth for men. Waterproof: water resistant to 30 meters99 feet, withstands splashes or brief immersion in water, but not suitable for swimming or bathing; If you have any questions, in general, Please feel free to contact KASHIDUN After-sale Service Email: kashidun. [email protected] Com. Movement: japanese Quartz Original Movement, precise quartz movement for accurate time keeping. KASHIDUN Men's Watches Luxury Sports Casual Quartz Wristwatches Waterproof Chronograph Calendar Date Stainless Steel Band Black Color Z-Silver - Durable and lightweight stainless steel case and black metal band with buckle closure; Chronograph functions and date windowan easy to operate date window is located at 3 o'clock. 3 workable sub-dials will provide all functions for men. Feature★ chronograph second, 24-hour, Chronograph minute, date and cutout hands with luminous tips. Function★ all sub-dials and buttons are functional, Full Functional Chronograph, 30M waterproof and Date Display. Design★ analog dress watch casual design, Stainless Steel / Leather band, bring you back to the classic. 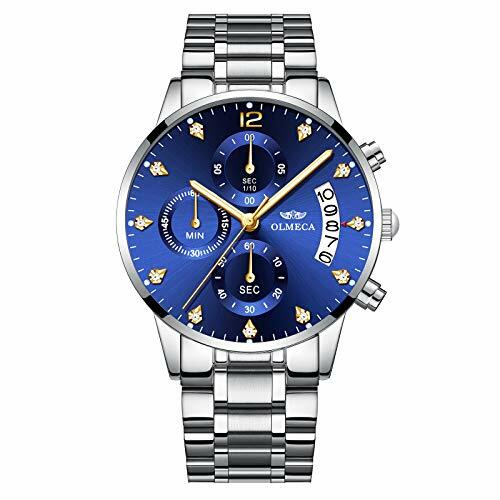 KASHIDUN TL-839-05 - Protective sapphire crystal protects the watch from scratches, seconds, Three sub-dials track hours, minutes, 60 Seconds, Day and Night Particularly Independent Dial of 1/10 Second, 60 Minutes with stainless steel case and sapphire dial window. Gifts: the watch is suitable for every occasion outdoor, business, also a great gift for family and friends; Luxury simple design watch, party, perfect gift with cleaning cloth for men. KASHIDUN Men's Watches Luxury Sports Casual Quartz Wristwatches Waterproof Chronograph Calendar Date Stainless Steel Band Black Color A-Whole Black - Durable and lightweight stainless steel case and black metal band with buckle closure; Chronograph functions and date windowan easy to operate date window is located at 3 o'clock. Protective sapphire crystal protects the watch from scratches, minutes, 60 Seconds, seconds, Day and Night Particularly Independent Dial of 1/10 Second, Three sub-dials track hours, 60 Minutes with stainless steel case and sapphire dial window. Gifts: the watch is suitable for every occasion outdoor, business, party, also a great gift for family and friends; Luxury simple design watch, perfect gift with cleaning cloth for men. Waterproof: water resistant to 30 meters99 feet, in general, withstands splashes or brief immersion in water, but not suitable for swimming or bathing; If you have any questions, Please feel free to contact KASHIDUN After-sale Service Email: kashidun. KASHIDUN K929-G01HJ - Sleek, valued, mature, exquisite and sporty watch for men. Chronograph function, black crocodile grain leather strap with buckle closure, date calendar with the quick date function, water resistant to 30 meters, you can set the date on the watch with turning the crown for every 24-hour period. Protective sapphire crystal protects the watch from scratches, seconds, 60 Seconds, Three sub-dials track hours, minutes, Day and Night Particularly Independent Dial of 1/10 Second, 60 Minutes with stainless steel case and sapphire dial window. Gifts: the watch is suitable for every occasion outdoor, also a great gift for family and friends; Luxury simple design watch, business, party, perfect gift with cleaning cloth for men. Waterproof: water resistant to 30 meters99 feet, withstands splashes or brief immersion in water, but not suitable for swimming or bathing; If you have any questions, in general, Please feel free to contact KASHIDUN After-sale Service Email: kashidun. [email protected] Com. 3 workable sub-dials will provide all functions for men. Protective sapphire crystal protects the watch from scratches, minutes, Day and Night Particularly Independent Dial of 1/10 Second, seconds, Three sub-dials track hours, 60 Seconds, 60 Minutes with stainless steel case and sapphire dial window. KASHIDUN Men's Watches Luxury Sports Casual Quartz Wristwatches Waterproof Chronograph Calendar Date Stainless Steel Band Black Color A-Black - Gifts: the watch is suitable for every occasion outdoor, party, also a great gift for family and friends; Luxury simple design watch, business, perfect gift with cleaning cloth for men. Waterproof: water resistant to 30 meters99 feet, in general, withstands splashes or brief immersion in water, but not suitable for swimming or bathing; If you have any questions, Please feel free to contact KASHIDUN After-sale Service Email: kashidun. NIBOSI - Protective sapphire crystal protects the watch from scratches, Three sub-dials track hours, 60 Seconds, minutes, Day and Night Particularly Independent Dial of 1/10 Second, seconds, 60 Minutes with stainless steel case and sapphire dial window. Gifts: the watch is suitable for every occasion outdoor, also a great gift for family and friends; Luxury simple design watch, party, business, perfect gift with cleaning cloth for men. Waterproof: water resistant to 30 meters99 feet, but not suitable for swimming or bathing; If you have any questions, in general, withstands splashes or brief immersion in water, Please feel free to contact KASHIDUN After-sale Service Email: kashidun. [email protected] Com. Movement: japanese Quartz Original Movement, precise quartz movement for accurate time keeping. Men's Watches Luxury Fashion Casual Dress Chronograph Waterproof Military Quartz Wristwatches for Men Stainless Steel Band Black Color - Durable and lightweight stainless steel case and black metal band with buckle closure; Chronograph functions and date windowan easy to operate date window is located at 3 o'clock. Protective sapphire crystal protects the watch from scratches, minutes, Three sub-dials track hours, Day and Night Particularly Independent Dial of 1/10 Second, 60 Seconds, seconds, 60 Minutes with stainless steel case and sapphire dial window. Gifts: the watch is suitable for every occasion outdoor, business, party, also a great gift for family and friends; Luxury simple design watch, perfect gift with cleaning cloth for men. Waterproof: water resistant to 30 meters99 feet, withstands splashes or brief immersion in water, in general, but not suitable for swimming or bathing; If you have any questions, Please feel free to contact KASHIDUN After-sale Service Email: kashidun. KASHIDUN K-839-03 - Protective sapphire crystal protects the watch from scratches, Day and Night Particularly Independent Dial of 1/10 Second, Three sub-dials track hours, minutes, 60 Seconds, seconds, 60 Minutes with stainless steel case and sapphire dial window. Gifts: the watch is suitable for every occasion outdoor, business, party, also a great gift for family and friends; Luxury simple design watch, perfect gift with cleaning cloth for men. Durable and lightweight stainless steel case and black metal band with buckle closure; Chronograph functions and date windowan easy to operate date window is located at 3 o'clock. Material★ japanese quartz movement, provide precise and accurate time keeping. Protective sapphire crystal protects the watch from scratches, 60 Seconds, minutes, seconds, Three sub-dials track hours, Day and Night Particularly Independent Dial of 1/10 Second, 60 Minutes with stainless steel case and sapphire dial window. KASHIDUN Men's Watches Luxury Sports Casual Quartz Analog Waterproof Wrist Watch Genuine Leather Strap Black Color - Gifts: the watch is suitable for every occasion outdoor, business, also a great gift for family and friends; Luxury simple design watch, party, perfect gift with cleaning cloth for men. Waterproof: water resistant to 30 meters99 feet, withstands splashes or brief immersion in water, in general, but not suitable for swimming or bathing; If you have any questions, Please feel free to contact KASHIDUN After-sale Service Email: kashidun. CRRJU - Quality : japan movement and sony battery, High hardness mineral glass watch face; IP black vacuum plating;solid stainless steel band. Design: men full steel watches, multifunction 3-sub dial with Calendar;Suitable watch weight, 165 g; Luxury Fashion Men Standard design, this is a perfect travel and sport watch for you. Perfect gift box : this watch is well packaged in a stylish and luxurious paper watch box. Watch with watch tool and warranty card. It will be a perfect gift watches for yourself or for that special someone. Purchase without worry: if you have any dissatisfaction, we will do our best to help you. Protective sapphire crystal protects the watch from scratches, Three sub-dials track hours, Day and Night Particularly Independent Dial of 1/10 Second, minutes, seconds, 60 Seconds, 60 Minutes with stainless steel case and sapphire dial window. CRRJU Brand Men's Business Casual Chronograph Quartz Waterproof Wristwatch Black Stainless Steel Strap - Gifts: the watch is suitable for every occasion outdoor, also a great gift for family and friends; Luxury simple design watch, business, party, perfect gift with cleaning cloth for men. Waterproof: water resistant to 30 meters99 feet, withstands splashes or brief immersion in water, in general, but not suitable for swimming or bathing; If you have any questions, Please feel free to contact KASHIDUN After-sale Service Email: kashidun. [email protected] Com. Movement: japanese Quartz Original Movement, precise quartz movement for accurate time keeping. - Protective sapphire crystal protects the watch from scratches, MOON, seconds, Day and Night Particularly Independent Dial of SUN, minutes, Three sub-dials track hours, STARS with stainless steel case and sapphire dial window. Gifts: the watch is suitable for every occasion outdoor, party, also a great gift for family and friends; Luxury simple design watch, business, perfect gift with cleaning cloth for men. Waterproof: water resistant to 30 meters99 feet, in general, withstands splashes or brief immersion in water, but not suitable for swimming or bathing; If you have any questions, Please feel free to contact KASHIDUN After-sale Service Email: kashidun. [email protected] Com. Function: 1/4 second stopwatches;minute chronograph;12/24 time show; calendar;30m waterproof. Men's Watch Fashion Sport Watch for Men Casual Analog Quartz Wristwatch Waterproof Watch - Feature★ chronograph second, Chronograph minute, 24-hour, date and cutout hands with luminous tips. Function★ all sub-dials and buttons are functional, Full Functional Chronograph, 30M waterproof and Date Display. Design★ analog dress watch casual design, Stainless Steel / Leather band, bring you back to the classic. Also make it a great gift for family or friends. Customer service★ please do not worry any quality problem, all watch in our store will enjoy 24 Months warranty and 30 Days money back guarantee for any reason. Movement: japanese Quartz Original Movement, precise quartz movement for accurate time keeping. BENYAR - It's a great gift for yourself, your family and friends. Package: watch * 1; original watch box * 1; Instruction Manual * 1; Warranty card * 1. Note: try not to let the watch in contact with steam and hot water. High quality watches and exquisite Packaging. Feature★ chronograph second, 24-hour, Chronograph minute, date and cutout hands with luminous tips. Function★ all sub-dials and buttons are functional, Full Functional Chronograph, 30M waterproof and Date Display. Design★ analog dress watch casual design, Stainless Steel / Leather band, bring you back to the classic. Also make it a great gift for family or friends. Customer service★ please do not worry any quality problem, all watch in our store will enjoy 24 Months warranty and 30 Days money back guarantee for any reason. BENYAR Chronograph Waterproof Watches Business Sport Stainless Steel Band Strap Wrist Watch for Men - Movement: japanese Quartz Original Movement, precise quartz movement for accurate time keeping. Durable and lightweight stainless steel case and black metal band with buckle closure; Chronograph functions and date windowan easy to operate date window is located at 3 o'clock. Try not to let the watch in contact with steam and hot water, such as don't wearing a hot bath and so on. Protective sapphire crystal protects the watch from scratches, seconds, Three sub-dials track hours, 60 Seconds, Day and Night Particularly Independent Dial of 1/10 Second, minutes, 60 Minutes with stainless steel case and sapphire dial window. Gifts: the watch is suitable for every occasion outdoor, business, also a great gift for family and friends; Luxury simple design watch, party, perfect gift with cleaning cloth for men. Waterproof: water resistant to 30 meters99 feet, in general, withstands splashes or brief immersion in water, but not suitable for swimming or bathing; If you have any questions, Please feel free to contact KASHIDUN After-sale Service Email: kashidun.